All external links on this site are provided for your convenience only. The League of Women Voters of Montezuma County exercises no control over the information or opinions contained in them. Provision of these links does not indicate an endorsement of their contents by the LWVMZC. The following is about the Colorado League Legislative Letter availability on their website. “The LWVCO Legislative Letter is made possible by the hard work of our dedicated Legislative Action Committee volunteers, along with Chris Watson, our staff lobbyist, the LWVCO office, and the support of all of you who donate to the LWVCO Lobby Fund and subscribe to the Legislative Letter. Thank you for your continued support and dedication to producing this important publication. You can always find our latest news in our monthly newsletter in the menu at left. Click each link to read the corresponding article. This year the League Day weekend in Denver was wonderful for Chris and me. The drive to and from Cortez was exceptionally beautiful with fall foliage color! The east side of Wolf Creek Pass took the prize! Make sure you check out the League’s Vote411.org website and follow the directions below. Or you can enter your information and try Vote411 on our website, lwvmontezuma.org. Sally Augden, LWVCO Board Member and Chair of LWVCO Legislative Action Committee emphasizes the need for Montezuma participation on the Committee. The Study’s Purpose: To investigate the impact of the practice of hydrofracturing for natural gas, oil and methane on the State of Colorado and its citizens, and to discern what public policies are in place or need to be in place for the activity. The LWVMZC Membership Drive is underway and we hope you will renew your membership. A letter regarding membership renewal and a list of “opportunities” for member involvement, will arrive in your “snail” mail box later this month. This next year will be a busy one and we’ll need your help and support to bring our community information about all of the election issues. Use your browser’s Return button to come back here. Our Board for 2012 with contact information. Materials on the Affordable Care Act, its implementation in the states and benefits to individuals and small businesses are available from many sources. Additionally, there are knowledgeable individuals in Colorado who may be called upon to answer questions or make presentations to groups. LWVUS sent a range of comments to the Bureau of Land Management regarding a proposed rule that would regulate hydraulic fracturing on public land and Indian land. Defending the Clean Air Act: The League joined with the environmental community in sending two letters to the U.S. House of Representatives in defense of the Clean Air Act. At National Convention, the following resolution was adopted. Here is our chance to commit and act on it. Representatives of the Air Pollution Control Division, La Plata County and Mountain Studies Institute will brief the Commission on air quality issues facing the Southwest Colorado area. The Commission will take open public comment regarding air quality concerns facing Southwest Colorado’s communities. Comments will be in the order you sign in - 'first come first served'. Best to have something written you could leave with them. Comments by the League of Women Voters of Montezuma County. Agenda - They WILL take comments, regardless of the up−front statement in the agenda. A series of open houses and hearings will be held over the next few weeks for the public to learn more about the Boggy−Glade Roads and Trails proposals and provide comments to the Forest Service. Thur, June 23: Open House Dove Creek School Commons, anytime between 5 and 8 p.m.
Tues, June 28: Public Hearing Cortez High School Foyer, sign in 6:30-7 p.m., hearing begins at 7 and ends at 9 p.m. Wed, June 29 Public Hearing Dove Creek School Commons, sign in 6:30-7 p.m., hearing begins at 7 and ends at 9 p.m.
Reference: Hearings in EIB 11−01 Proposed Revisions to the NM State Implementation Plan for Regional Haze and 11−02 Proposed revisions to State Implementation Plan to Satisfy requirements of Clean Air Act 1 110(a)(2) (D) (i) (II0 with respect to visibility. Thank you for the opportunity for League of Women Voters of Montezuma County, Colorado to comment to the Environmental Improvement Board regarding the proposed revisions to the NM State Implementation Plan for Regional Haze and revisions to Satisfy requirements of the Clean Air Act. Montezuma County is one of the Four Corner counties and is the location of Mesa Verde National Park and the Ute Mountain Tribal Park. Prevailing winds carry pollutants from the San Juan Generating Station coal−fired power plant to our county. Hickenlooper EPA Letter re. New Mexico Power San Juan Generating Station BART proposal. Click here to read the cover letter. For decades the EPA has protected the health of children, seniors and all the rest of us from dangerous pollutants through the Clean Air Act. In just the last twenty years, carbon monoxide, which negatively affects those with heart and lung diseases, has been cut by seventy percent. 1. Contact your Representative now and tell him or her to oppose any legislation that would block or prevent action to clean up our air and protect the most vulnerable Americans. You can also call your Representative at 202−225−3121. 2. Send this alert to other concerned citizens −− your grassroots network, your friends and coworkers. Encourage them to contact their elected leaders. The House of Representatives has unveiled a spending bill that will roll back and defund programs that control life-threatening pollution. This legislation will effectively stop the EPA from protecting America’s most vulnerable groups, such as seniors and children, in favor of protecting the bottom line of big polluters. Take action now to tell your Representative to oppose any legislation that would block or prevent action to clean up our air and protect the most vulnerable Americans. The League of Women Voters, founded 90 years ago as an extension of the women’s suffrage movement, has worked harder and longer than any other group in the United States to ensure that this country’s elections are fair, that citizens can engage, and that the promise of American democracy will be fully realized. Historically, candidates of all parties have respected and worked with the league. For decades, the coal−fired Four Corners Power Plant has been sitting in far northwestern New Mexico, churning out electricity for families across the Southwest and pumping out millions of tons of carbon emissions and other pollutants. It has been a popular target for environmentalists, but yet it has always been just out of reach for New Mexico regulators because of its location on the Navajo reservation. BLUE GAP, Ariz. − For decades, coal has been an economic lifeline for the Navajos, even as mining and power plant emissions dulled the blue skies and sullied the waters of their sprawling reservation. But today there are stirrings of rebellion. 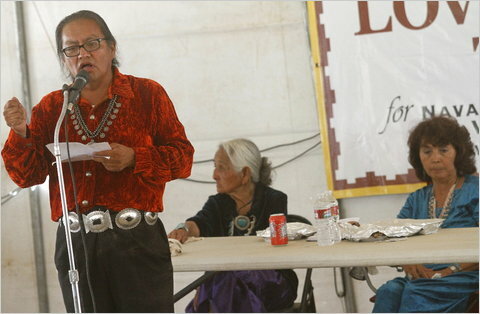 Seeking to reverse years of environmental degradation and return to their traditional values, many Navajos are calling for a future built instead on solar farms, ecotourism and microbusinesses. EPA proposes pollution controls for nation’s largest source of NOx: Four Corners Power Plant SAN FRANCISCO − Today, the U.S. Environmental Protection Agency proposed requiring additional pollution controls for the Four Corners Power Plant located on the Navajo Nation near Farmington, New Mexico to improve visibility and human health. EPA’s proposal will require plant operators to install the most stringent pollution control technology available for this type of facility. These controls will reduce emissions of nitrogen oxides (NOx) from approximately 45,000 tons per year to 9,000 tons per year. LWVCO Ballet Issue 2010 Pamphlet Including Constitutional Initiatives 60, 61 and 101. Follow the directions to select candidates and print out a sample ballot. 2010 Climate Conference: Managing for Resiliency in the San Juan Mountains−Adaptation and Planning for Climate Change The Mountain Studies Institute and other partners are sponsoring a 2010 Climate Conference: Managing for Resiliency in the San Juan Mountains−Adaptation and Planning for Climate Change. The conference will be held in Silverton, CO, October 7-9, 2010. For more information please go to the conference website. Letter to the EPA from LWVMZC and LWVLAPLATA "The League of Women Voters (LWV) of Colorado (CO) has worked to protect both the quality and quantity of our water resources since the 1950´s. We believe that our natural resources should be managed as interrelated parts of life supporting ecosystems and that the pollution of these resources should be controlled in order to preserve those ecosystems and protect public health." Presentation by Jeannette Hillary, chair of the LWVCO Legislative Action Committee, of the EPA Frac´ing letter from LWVMZC and LWVLAPLATA "The League of Women Voters of Colorado is pleased that the EPA´s Office of Research and Development will be conducting a scientific study to investigate the possible relationships between hydraulic fracturing and drinking water." The League of Women Voters of Montezuma County has the following comments and concerns on the subject Environmental Assessment for Kinder Morgan´s proposed six new wells for carbon dioxide extraction and associated pipeline system. Dr. Marcia Angell, a single-payer advocate, doesn´t think there´s much in the President´s plan to feel good about. But it´s not just the particular version that she objects to − rather that the bill doesn´t address what´s fundamentally wrong with the American health care system. EPA Four Corners Position!! −−−−>See the description and links in the right sidebar. Ozone Readings in Cortez − Real Time !! Colorado Department of Public Health and Environment provides ozone readings for the past 12 hours. See right sidebar. Ozone Readings in Cortez − Long Term Table. See right sidebar. Colorado Department of Public Health and Environment table of 1st, 2nd, 3rd, 4th and 5th maximum 8hr average ozone readings as well as 3 year average of 4th maximum values. The League of Women Voters of Montezuma County will celebrate the 90th anniversary with a cake cutting at the general meeting "Legislative Lowdown" for interested public on Saturday, February 20 at 2 P.M. in the Calvin Denton Room of Empire Electric Association, 801 N. Broadway, Cortez. Our State Senator, Bruce Whitehead and Representatives Ellen Roberts and Scott Tipton are invited to discuss 2010 Colorado Legislative efforts and issues. The League of Women Voters (LWV), a nonpartisan political organization that works to improve our system of government and impact public policies through citizen education and advocacy, is celebrating its 90th anniversary in 2010. Not coincidentally, the 19th amendment to the United States Constitution that gave women the right to vote celebrates its 90th anniversary in 2010, as well. "The women who started the movement to give women the right to vote really didn´t know where it would end, how it would end, or when it would end," said League of Women Voters president, Mary G. Wilson. "And yet they persevered. They persevered in a time when it wasn´t fashionable for women to speak out on any issue − let alone try to get some rights for themselves. They worked against all odds − and succeeded." Sustainability Study Documents The LWVCO Sustainability Study will start soon. More background documents have recently been added and may be found here. "Great Decisions" Discussion Groups Starting Great Decisions discussion groups focus on the Great Decisions briefing book. This well researched annual publication provides eight timely global topics read by group participants prior to meetings, in order to guarantee that all discussion group members come together from the same point of reference, with the same facts and basic understanding of the issues to be discussed. Everyone is encouraged to share his or her thoughts and each participant's point of view carries equal weight. In conjunction with the League of Women Voters of Montezuma County two Great Decision Discussion Groups have been formed. Meetings to discuss 2009 topics will be held at the Mancos Library (533−7600) and to discuss the 2010 topics at the Dolores Library (882−4666). Attend both groups to discuss all 16 topics!! Click the links below to view the topics. Mancos Topics from "Great Decisions 2009"
Dolores Topics from "Great Decisions 2010"
The Health Care Education background papers examine various questions. State and local Leagues may use these papers as bases for their own discussion and as reprints in League newsletters. Developers of the proposed Desert Rock power plant on the Navajo Nation reservation near Farmington have lost their bid for $450 million in stimulus money to install an expensive carbon−capture system in the facility, which would be the third coal−fired power plant in the Four Corners. 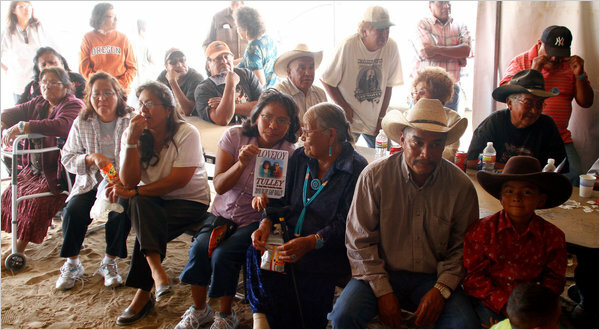 The proponents, the Navajo Nation and Sithe Global, in April were stripped of the air−quality permit they were granted in the summer of 2008 by the Environmental Protection Agency. The LWVMZC letter to the EPA regarding our local power plants is now available here. LWVCO is encouraging the public to be cautious during this period of circulation of initiative petitions. 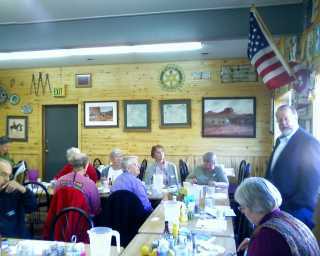 On Sat, October 17, Senator Whitehead spoke at the Pondeosa Restaurant in Dolores. He brought us up to date on many issues being considered, including water issues. Some presented at the "Dealing with Drought — Adapting to Climate Change" workshop in Durango Oct 22, 2009. The WWA, in conjunction with the Colorado Water Conservation Board (CWCB), presented the "Dealing with Drought-Adapting to a Changing Climate" workshop series during October in three locations around Colorado. These workshops built on themes and information from the October 2008 Governor’s Conference on Managing Drought and Climate Risk. The 80 participants represented diverse sectors and interests affected by drought and climate, including water resource management, agriculture, land-use planning, forest and range management, watershed protection, environmental organizations, and tourism & recreation. May´s warm and dry weather patterns have contributed to an early meltout of Colorado's mountain snowpack. With nearly uninterrupted snowmelt occurring throughout May, only remnants of last winter's snowpack now remain across southern Colorado. With the early melt, streamflows have responded accordingly with earlier than normal high volumes. Seasonal volume forecasts have not changed significantly from last month in most basins. For most of the state near average spring and summer runoff is forecast, with below average runoff forecast across the southwestern portion of the state. As expected, reservoir storage has improved significantly with the early snow melt and is currently in the best condition in a decade. Colorado Water Conservation Board "Climate Change in Colorado Fact Sheet"
The scientific evidence is clear: the Earth´s climate is warming. Multiple independent measurements confirm widespread warming in the western United States. in Colorado, temperatures have increased by approximately 2ºF between 1977 and 2006. Increasing temperatures are affecting the state´s water resources. Colorado Water Conservation Board's "Climate Change in Colorado" page. WASHINGTON — Generating electricity by burning coal is responsible for about half of an estimated $120 billion in yearly costs from early deaths and health damages to thousands of Americans from the use of fossil fuels, a federal advisory group said Monday. A presentation by Mike Silverstein (PDF), Colorado Air Pollution Control Division´s deputy director and the manager of the division´s Planning and Policy Program given at the Air Quality and it´s Impact on Health Forum, October 8, 2009. Mike´s main area of expertise is in air quality planning, which involves working with industry, government agencies and citizens to develop plans for areas that have violated National Ambient Air Quality Standards, such as the ozone standard. Mike also leads the division´s efforts to assess air quality issues in Rocky Mountain National Park and the Four Corners region. Mike holds B.S and M.S. degrees in Geography from the University of Colorado. Prior to joining the division, Mike was an environmental scientist with the E.P.A. in Denver and an environmental consultant. Try the search site All For Good. Enter your zipcode to search. Check out Serve.Gov for volunteer opportunities or to register your project and request volunteer help. DENVER — If Democrats pick a new state senator for Southwest Colorado this year, the appointee would have plenty of company among unelected lawmakers at the state Capitol. Twenty—one of the 100 members of the General Assembly first won their seats by appointment, not election. LWVMVC Letter to EPA re Desert Rock PSD and CO2 Regulation. Eric Janes, our Environmental Chairman, has written a letter which we have sent to the EPA stating our concern regarding the EPA's removal of CO2 monitoring from the PSD. Read about Eric's background in our November/December, 2007, newsletter in the lefthand menu. LWVUS Calls for Moratorium On Coal Fired Power Plants. Moratorium on New Coal-Fired Electric Power Plants Is Imperative to Address Global Warming. Global warming is happening, and its impacts are already being felt today. Click to read the article in our September Newsletter. An explanation by the EPA. This NYTimes online article from May 2011 draws some useful distinctions between “fracking” and other related aspects of oil and gas drilling. Recent posts on Midwest Energy News . From Chemical and Engineering News . “Role of the Federal Government in Public Education” Study Background PapersClick to go to the LWVUS page linking the papers. It is easier to say what consensus is not, than what it is. Consensus is...It is easier to say what consensus is not, than what it is. Consensus is not a vote; rather, consensus is mutual agreement of League members arrived at through discussion. During discussion, everyone has an opportunity to express their viewpoints, and the issue is examined from all sides. Consensus questions, created by the appropriate study committee and approved by the Board, provide structure for the meeting. Members discuss the pros and cons until it becomes apparent that consensus has/has not been reached on each question. The study committee analyzes the consensus responses and, using this information, creates a position statement. Global climate change is one of the most serious threats facing our nation and our planet today. Increasingly severe consequences are projected for more people and more regions of the world unless we act now — as individual, as communities, and as a nation. For its part, the League is calling for prompt action to cut this country´s GHG emissions, freeze construction of new coal−fired power plants, invest in a new clean energy economy, and help the world´s poorest countries tackle the challenges of climate change. It´s a very handy resource for information that used to be difficult to find. It´s available to help millions who need insurance find it, and as a resource for those who want to shop around for new options or find out their new benefits under the new law. where anyone can go to find insurance options in their state. Click to read newly adopted criteria for participation in LWVMZC candidate forums. Click to read this alert regarding the signing of various ballot initiative petitions. The League of Women Voters of LaPlata and Montezuma Counties have recently sent a letter to Lisa Jackson, Head of EPA, proposing that the agency provide the Four Corner Area with a senior position reporting to EPAUS who would encourage and help to create a system-wide approach to solving air quality problems within the Four Corners. It is hoped the new EPA Four Corners position would lead to a singular, system focus for the three EPA regions that oversee the Four Corner Area: Denver Regional office for Colorado and Utah; Dallas Regional office for New Mexico and San Fransisco office for Arizona. In addition to the letter, here are links to a summary of the proposal made to the EPA by the two Leagues of SW Colorado, and a draft description of the senior position. Ozone Readings in Cortez − Long Term Table. Colorado Department of Public Health and Environment table of 1st, 2nd, 3rd, 4th and 5th maximum 8hr average ozone readings as well as 3 year average of 4th maximum values. Colorado Ozone Tech. Support Document Colorado Department of Public Health and Environment PDF document contains ozone requirements and a great deal of general information about areas of the state including Montezuma county. Search the document for 'Montezuma'. TEXT to Small or Large? Health Care Issues Behind Health Care Reform is new (2009). The League of Women Voters of Arizona has just published this comprehensive booklet on the health care issues that are driving health care reform efforts in the U.S.
Must read book - Hot, Flat and Crowded by Thomas L. Friedman.